Busy Beading a Russian Cathedral.. Here is the latest progress on my bead painting. 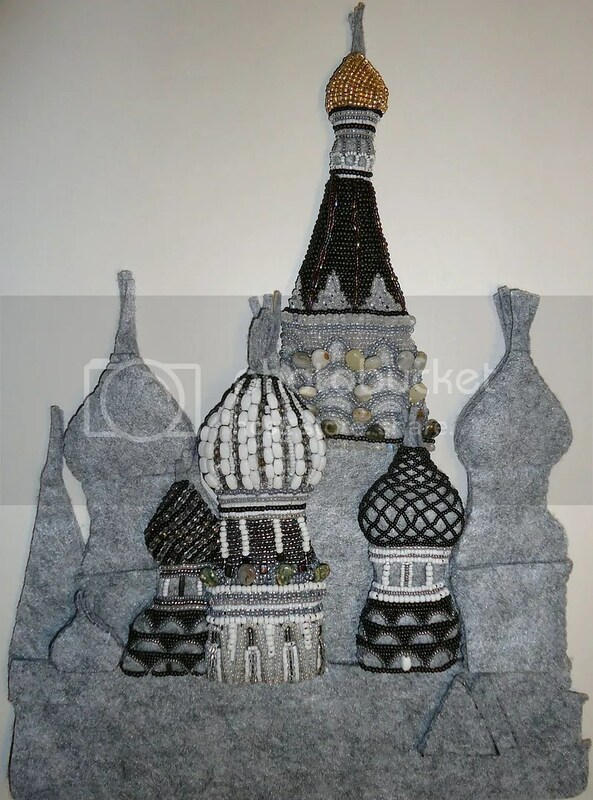 Yesterday, I finished beading the 6th small chapel which surrounds my felt Russian cathedral. I am using all different sorts of glass seed beads as well as tanzanite Swarovski crystal bicones. (Can you see them?) Beads are stitched to the felt using needle and thread. Bead embroidery in progress. 10″ x 13″. Currently, the chapels are still independent pieces of beadwork which will eventually be stitched to the bottom layer of felt. I also just ordered custom sterling silver crosses to stitch to the top of the onion domes. Can’t wait to receive them.. How does it look so far? Please check Facebook or Twitter for my next update:) Thanks for your interest in my beadwork!